The 2008 Noida double murder case investigating the murder of Aarushi Talwar and Hemraj became a national sensation with the media giving it full attention. In a way, it was even considered trial by media! Avirook Sen (center – above photograph) has authored a book on this case: ‘Aarushi‘. 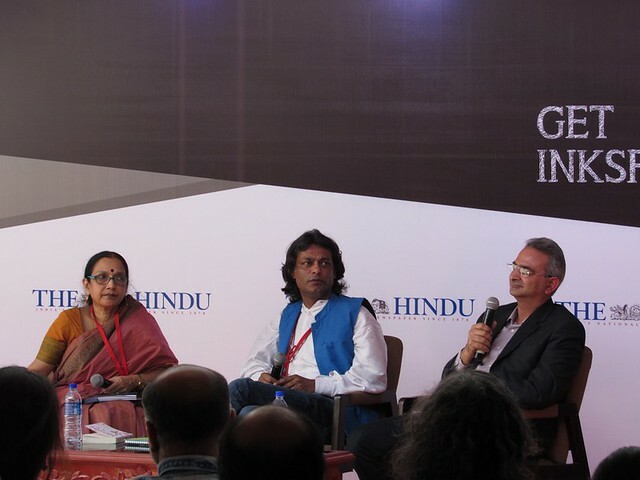 The author was in discussion with Tanveer Ahmed Mir (Defense lawyer for this case) and Geeta Ramaseshan at the Hindu Lit for Life 2016 @ Chennai. Here are some quotes I gathered from there. If you want to learn more details about this case, and about how things are conducted in session courts in India, and about how the legal & law-enforcement systems work here, you might want to check the book out!